Below we share the best bedroom colors for 2018 including trending decor, paint, textures & finishes for an impressive design. As 2018 is just getting started we are looking forward to the new color trends that a new year brings. For many of us, that means redecorating an old space or designing a new space, and personal spaces such as our bedrooms are at the top of our list. 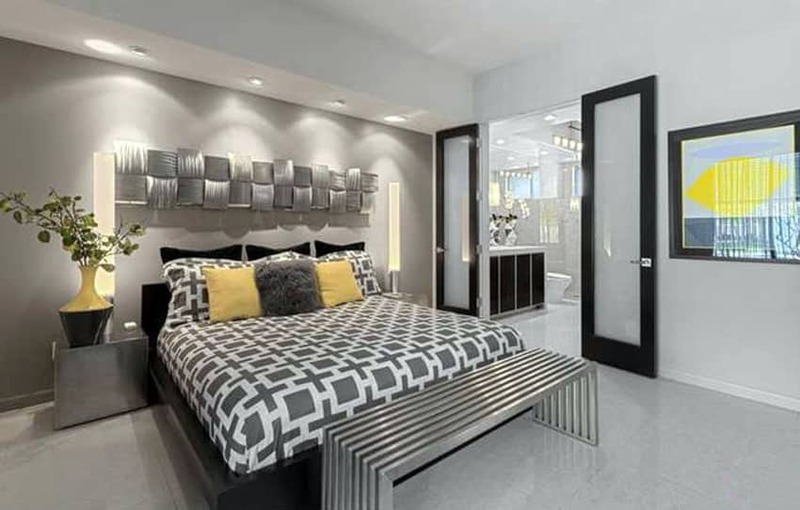 Fashion and beauty, tech, and travel have been massive trends this past year and are strongly influencing the colors and styles that we are seeing in interior design. Washed, worn, comfortable, organic, fluid. They aren’t just buzzwords, they describe the soft pinks, toned-down greys, washed-out greens, and sand-dune browns that seemingly melt into one another and create a natural, organic flow. 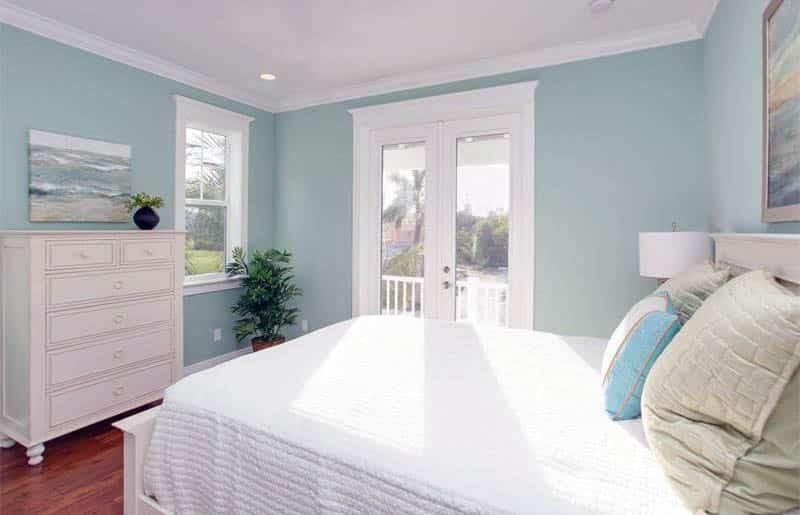 The first thing that we often thing about when it comes to color is wall paint. For those of us living in a space that doesn’t allow for painted walls, look to what you can add color to. If you have wood furniture, sand it down and give it a fresh coat of neutral grey. Scour flea markets and Saturday farmer’s and arts markets for a faded and worn wool Persian rug in tones of green and pink. If the rug is on the small side, grab an oversized but inexpensive sand-colored jute rug and layer it under the smaller rug, anchor it with your bed and side tables. It is still a minimalism-inspired look, but less structured and more well-traveled. Keep your accessories simple, add some metal-framed end tables, and let your colors blend and blur for a soft, relaxing feel. If wanderlust has you in its clutches but a trip around the world isn’t in the budget, go global with color in your bedroom. Put a neutral almond color or attractive beige on the wall, anchor the room with deep brown wood furnishings, and pop bold, Aegean blues or bright fuchsias around the space. Grab a brightly colored Peruvian Frazada style wool rug for your floor or use it to reupholster a comfortable mid-century chaise lounge. Pull the bright blues and pinks from the rug as your color inspiration for the throw pillows on the bed and accessories on your shelves. Top your mismatched bedside tables with mid-century teak lamps and natural jute shades to bring a sophisticated glow to your global space. To keep your look streamlined, use a simple, neutral quilt similar to your wall color and keep accent pillows minimal. For a more bohemian global look, layer a colorful quilt and knit blanket and add tons of accent pillows. Tech is hot for 2018, smart homes and clean energy are becoming more affordable and we are taking design cues from the headquarters of the tech giants. Contrasting colors, sharp edges, and clean lines are the hallmarks of tech design. Start with a base of stark white and midnight black. Paint one or more walls black and put a brushed nickel, floor to ceiling 4-poster bed in front of it, or try a stylish platform bed with tufted headboard. To brighten things up for this design, try adding a stunning, bright, bleach-white flokati rug under foot to add texture and keep things from looking too cold. For a truly tech twist, add aggressive lime green bedside tables. Grab a lime green Eames chair to put in the corner along with a funky, modern pendant light and clear acrylic side-table. For rooms with only one black wall you can add extra drama by including midnight black heavy velvet draperies. This will keep the look luxe and modern and add some much-needed softness. Keep bed linens simple and snow-white, use lime green and white accent pillows in varying textures. Don’t be afraid to experiment with geometric designs and original, abstract artwork in wild, bright colors. 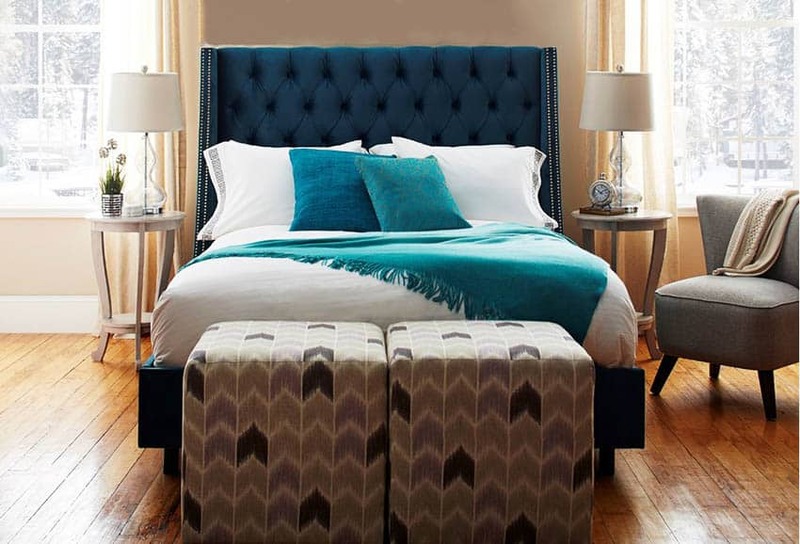 Another popular bedroom trend this year is creating the feeling of a harmony with colors that emphasize a sanctuary feel. Color such as soft greens with a color palette of matching sandy browns, and other organic shades can harmonize together to create a sense of well-being and peace. On the other side of the spectrum from muted soft colors is red which is also hot for 2018. A deep, burnt, brick red accented with caramel brown and brassy, bronzy gold tones. This rich red is perfect for a myriad of looks but it looks amazing in a transitional or eclectic bedroom. Whether you use it for paint or as an accent in your textiles, you can’t help but heat up your bedroom with this color! Go ahead and paint all of your walls, this red isn’t jarring or bright, and can make your room appear larger as long as the furniture is appropriately scale for the space. Because this is a brown-based red, it naturally works great with tones of brown. A beautiful, creamy caramel leather-upholstered headboard is a stunning way to accent this gorgeous red. Brushed bronze accents in the form of lamps and framed black and white landscape photography add depth and personality. Pile on the tonal look with camel-colored and deep goldenrod bedding and draperies. And Indian rug is a natural fit here as they are often woven in tones of red and brown, find one with accents of navy blue to pull in an extra layer of color and interest. This is a cozy, warm, eat pancakes in bed at noon on Sunday type of bedroom. A bit spicy, but not overwhelming, romantic but not cliched, a perfect red for 2018 and beyond. I would be remiss if I didn’t bring up millennials. Not only are they influencing design in a huge way, but Millennial Pink is one of the biggest trending colors two years in a row. Pair it with white and tangerine for a new twist on a color that was everywhere in 2017. Millennial Pink is a soft, tonal color that works just as well as an accent as it does a base color. Rose gold, flat black, and pewter are all great metals to pair with this pink and tangerine combo. 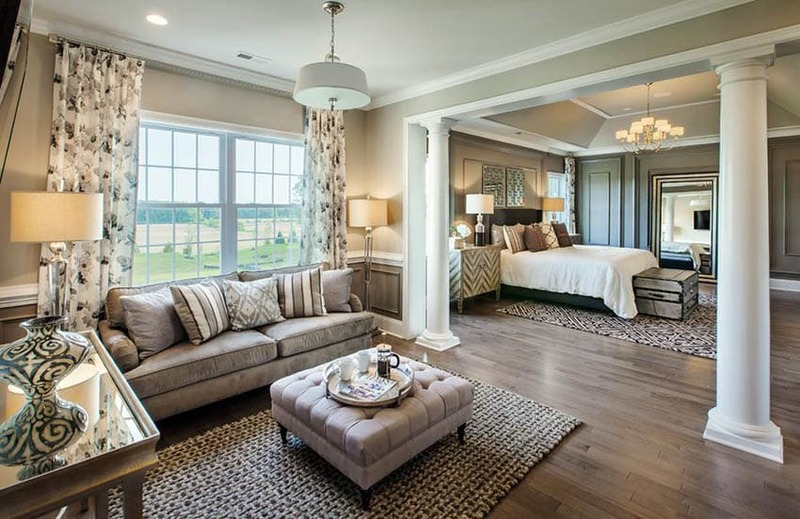 It is perfect for shabby chic, Manhattan chic, and traditional bedroom design. Because it is such a timeless color, you won’t need to repaint every few years, just change up your accessories and accent colors to keep it super fresh. We are seeing new influences in design, from Instagram beauty divas to tech giants, inspiration is coming from more than magazines these days. We have left the days of bland, beige neutrals behind and have embraced grey as the new IT neutral. Dark colors have gained steam, from moody navy blues to baked clay brick reds and even indigo-hued blacks, we are seeing dark colors trending like never before. Light colors still abound in minimalist décor but they are all tonal, blending fluidly into each other, with much less structure and separation than we saw in 2017. With a focus on practicality, affordability, and eco-friendly design, we are seeing more DIY projects and more of a willingness to experiment with color than we have in the past.